Readability is an extension for Firefox and Google Chrome that removes ads and other distractions from a web page. This can help your students focus on the content, rather than on the clutter surrounding it. Install the Readability extension for Firefox by going to the Firefox Add-ons site at https://addons.mozilla.org and searching for Readability. For Google Chrome, visit the Google Chrome Extensions Gallery at https://chrome.google.com/extensions and search for Readability. Once Readability is installed, you can activate it by clicking once on the blue Readability icon in the lower right hand corner of the Firefox window or on the Google Chrome toolbar. 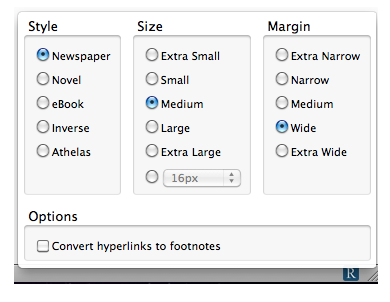 You can also activate Readability using a keyboard shortcut: Control, Alt, R on windows or Command, Option, R on the Mac. To return to the original version of the page the keyboard shortcut is Control, R on Windows and Command, R on the Mac. While Reability is activated, you can also return to the original version of a page by clicking on the Reload original page icon in the upper left corner of the page. 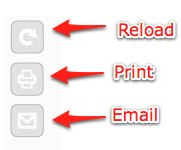 You will also see icons for printing the page and emailing it to another person. To access the Options for Readability, right-click on the Readability icon in Firefox, or right-click and choose Options in Google Chrome. The options include changing the layout (including Inverse for a high contrast display), the text size, and the margin width.